Fall has finally arrived. I’m absolutely thrilled, believe me. There is little as stifling as summertime in Atlanta. This is my favorite time of year – for food and otherwise. Great soups, my mom’s German recipes, and big baggy sweaters to cover up the end result of all this hearty eating. The version I’ve been making is from Tyler Florence’s Eat This Book. I’ve made several recipes from this cookbook and its becoming a staple go-to for me. The recipes aren’t crazy difficult and the flavors are bold and varied. For the batch that I photographed, I was tempted to leave out the celery leaves. Why do I need to bother buying a bunch of celery just for the leaves? Trust me – don’t. Not only did they provide a very serendipitous styling moment there with the leaf in the front…but they do add a great extra flavor to the salad. Toss the bread chunks with ¼ cup oil until the bread is wet with the oil. Spread the bread on a baking sheet and back until the bread begins to brown, about 10 minutes. While the bread is going, make the dressing. Use a large knife to chop and mash the garlic, anchovies, and salt to a paste on a cutting board. Scrape it into a large mixing bowl, add the lemon juice, vinegar, oil, salt, pepper, and stir together. Add all of the rest of the ingredients and gently stir. Taste for seasoning. Finally, add the toasted bread and toss it all together. Taste it and season one last time with salt, pepper, and lemon juice. 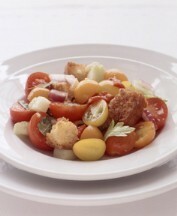 I too wonder how come we don’t see Panzanella on more menus in Atlanta. Thanks for passing this recipe along. I mean, really. Could this be easier to make…and more cost effective? I guess a lot of people dont know what it is. The only place I’ve ever had it here in Atlanta was Figo..and while it was good (its tomatoes and bread and garlic..how could it not be!? )..I still liked mine better.